When someone says puffy jackets to me for winter, I tell them they’re not me. In my opinion, there is nothing attractive at all in looking like an abominable snowman. Now, for a couple of seasons, they have not appeared a lot in the catwalk collections and I was very surprised to see this trend appearance this year. The sporty trend is catching up quickly to the upcoming Olympics and the rising ambition of many women and women designers wanting to be able to move freely and still feel comfortable has finally been answered to, so the A/W catwalks literally exploded with different shapes. 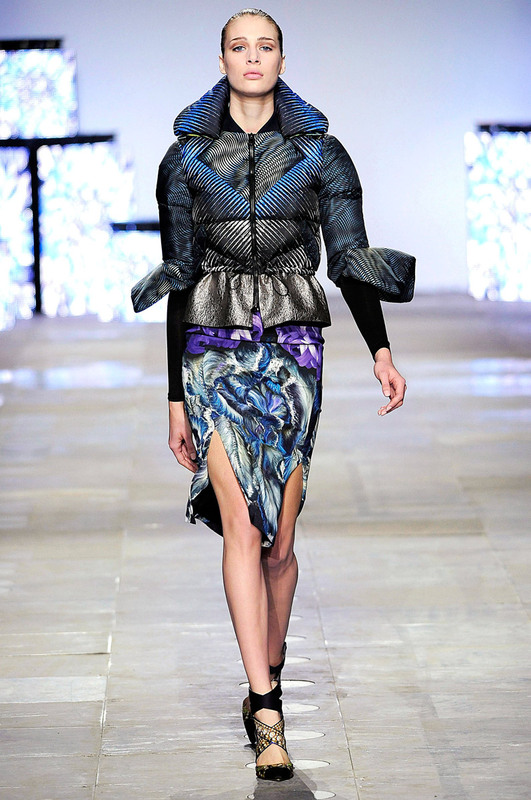 Now while at John Rocha the material was curled into flowers and at Mulberry there was a myriad of etched colours with large furry hoods, it was Peter Pilotto’s collection which truly caught my eye. After emerging into the mainstream of fashion last year, the two graduates of Antwerp’s Royal Academy of Fine Arts have stuck their brand high in the list of new and upcoming designers along with Mary Kantrantzou and Christopher Kane. What fascinated me was their vision and inspiration- digitally transforming microscopic images into prints in such a way that they would envelop the woman’s body. Individual and bright, their S/S 2012 collection was painted blue, red, and yellow, and for their A/W 2012/13 collection, they decided to go a bit darker in their aesthetic. I have never seen a company which not only transforms my least fashionable item of clothing in my wardrobe but does it with such style and ease that it seams natural to wear it. Their iridescent patterns and colours inspired by the creatures of the sea (mostly stingrays and jelly fish) create a kingdom where black and blue dominate shot across with yellow, green and white. The classic scarred effect mixed with the cutting of the fabric creates a wonderful geometric pattern both on the puffy jackets and the symmetrical dresses. A new aspect to their collection was the direct Chinese influences, both by the use of tightly cut velvet in their pieces and adding geometrically shaped fabric to the necklines. The designers are known for taking the inspiration for their collections from their trips, and it was during their visit to China that they discovered its richness. 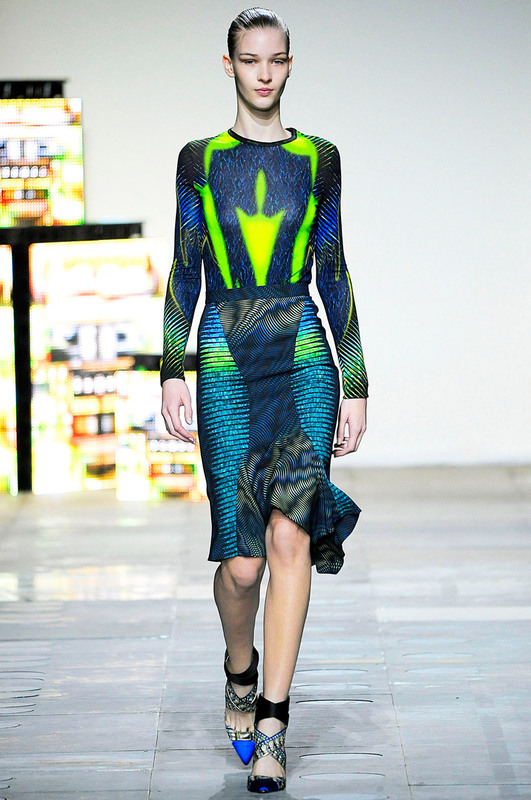 Previously, they were inspired by palm leaves and butterfly wings seen under the microscope. Hopefully, this collection will bring them an even better review than the last, as they have outdone not only ideas but also their own creativity. New York Fashion Week: Elegant or Fun?